The Infinity Corner Office Workstation offers sit to stand adjustability while making the most out of limited space. This flexible dual surface workstation easily accommodates two large monitors, with room to spare. 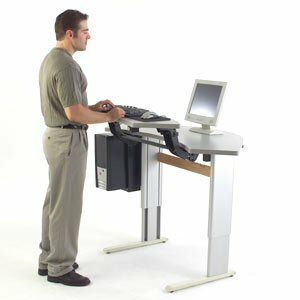 Ergonomic repositioning is easy-the push of a button adjusts the workstation height from 27-39 inches for sit-to-stand working heights. An extremely quiet motor smoothly raises and lowers up to 450 lbs. of computer equipment. With such ease of adjustment, the Infinity Corner Office is perfect for environments where multiple users share the same equipment. The keyboard surface adjusts independently, with a range of 4 inches below to 7 inches above the larger worksurface. With its corner design, the Infinity Corner Office easily retrofits into systems furniture layouts to simplify the implementation of an ergonomics program. Sturdy metal legs are graphite silver. UL Listed. Two-Year Warranty.